MOJAVE, California, July 21, 2011 (ENS) – For more than a decade, American aerospace engineer Burt Rutan dreamed of building a flying car. Now, the company he founded has built a prototype of his dream. The company, Scaled Composites, has developed a hybrid gasoline-electric roadable aircraft as part of an internal research and development program. The Model 367 or BIPOD, was Rutan’s final design before his retirement in April after a distinguished career. During initial conceptual design studies, Scaled Composites found that many of their propulsion system characteristics were “well aligned with the drivetrain needs of a roadable vehicle” and expanded the research program to include a “flying car” airframe, the company said in a statement Monday announcing the new vehicle. “The vehicle performed well during initial ground and flight testing. The low center of gravity and wide track resulted in a stable, controllable road configuration both on the skid pad and at freeway speeds. Initial flight tests indicate that the vehicle is stable and controllable,” the company said. With the impending deadline of Rutan’s retirement, Scaled Composites pursued an aggressive schedule and achieved first flight of the BIPOD vehicle within four months of beginning preliminary design. The entirely new design will operate as a high-performance airplane with short take-off and landing capabilities, a 200 mph maximum speed, and 700 mile range or as a road commuter vehicle capable of freeway speeds, urban driving, and garage storage. Rutan and his team specified a configuration that was safe for ground operations, yet still efficient at high flight speeds. Accordingly, BIPOD’s twin fuselage configuration provides a low-drag enclosure for a four-wheeled chassis with two cockpits. It provides a protected storage location for the wings and tail surfaces while the vehicle is on the road. Two internal combustion engines, one per fuselage, provide power to the rear wheels and to propellers located on the horizontal stabilizer. Lithium batteries in the nose provide additional energy for take-off and in the case of an engine emergency. The vehicle’s center of gravity is positioned for ground operation stability, while aircraft rotation is enabled by direct blowing of the horizontal stabilizer and by applying power to the rear wheels. The use of electric power transmission decouples engine location from propeller location without the need for mechanical shafts and gearboxes, enabling BIPOD’s unique geometry, said Scaled Composites. Despite “inherent inefficiencies associated with energy conversion steps,” Scaled Composites believes “hybrid systems may offer advantages for specific mission requirements, such as distributed propulsion, multi-mode operation, or energy recovery.” The use of carbon fuels provides better energy density and a lower gross take-off weight for the same range when compared to electric-only vehicles, the company said. 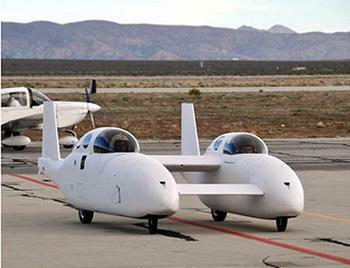 Scaled Composites is continuing to test and develop the BIPOD configuration and hybrid propulsion system, with the goal of using similar systems on future unique aircraft configurations. Rutan founded Scaled Composites in 1982 in the small desert town of Mojave to design research aircraft for the government and commercial customers. Now, five of the airplanes he designed there hang in the Smithsonian National Air and Space Museum, including the Voyager, which in 1986 became the first plane to fly around the world without refueling, and SpaceShipOne, which in 2004 became the first private rocket plane to launch a man into space. The next advance in U.S. military transportation could be “vertical take-off and landing, road-worthy vehicles,” or, in civilian language, flying military cars. With its new Transformer, or TX vehicle, program, the U.S. Defense Advanced Research Projects Agency (DARPA) seeks to combine the advantages of ground vehicles and helicopters into a single vehicle, maximizing flexibility of movement. DARPA says the enhanced mobility of the TX vehicle would increase survivability by making movements less predictable and would make the vehicle suitable for a wide variety of missions, such as scouting, resupply and medical evacuation. As envisioned by DARPA, each vehicle would carry a four-person “payload” up to 250 miles on a single tank of fuel. The vehicles and would be able to safely travel on roads and be operated by a typical soldier. “The TX is all about flexibility of movement and key to that concept is the idea that the vehicle could be operated by a soldier without pilot training,” said Sanjiv Singh, a professor of robotics at Carnegie Mellon’s Robotics Institute in Pittsburgh, which has a contract worth nearly $1 million to develop an autonomous flight system for the Transformer program. The TX concept would provide options to counter threats while avoiding road obstructions. Technical areas being explored include: a hybrid electric drive ducted fan propulsion system, ring motors, energy storage methods such as batteries and ultra capacitors, morphing vehicle bodies, and advanced flight controls and flight management systems. Singh applied expertise in robotic perception and planning to demonstrate a fully autonomous helicopter flying between wires, trees and buildings in DARPA’s Organic Air Vehicle II (OAV2) program. Working with Piasecki Aircraft earlier this year, Singh demonstrated that a full-size helicopter could avoid low altitude obstacles, select a landing site and land without human input. Carnegie Mellon’s Robotics Institute is one of six contractors DARPA has chosen for the TX program to work towards development of the flying military vehicle. The focus of the Carnegie Mellon research is situational awareness, collision avoidance and intuitive control. Honeywell Laboratories, which worked with Carnegie Mellon in the OAV2 program, is a subcontractor to Carnegie Mellon and will work on the human factors issues associated with the program. AAI Corp. and Lockheed Martin Co. were selected by DARPA to develop overall design concepts for the vehicle during the first phase of the TX program. Pratt & Whitney Rocketdyne signed a million dollar contract with DARPA to develop the engine technology. The engine of choice is the EnduroCORE, a durable, lightweight, high-performance diesel engine. The company says the fuel consumption of the full-compression, full-expansion, diesel-cycle engine, is comparable to that of diesel piston engines. The transportation needs of today’s deployed fighter are now met by either a helicopter or highly mobile multipurpose wheeled vehicles, Humvees. Both modes of transportation have limited availability. 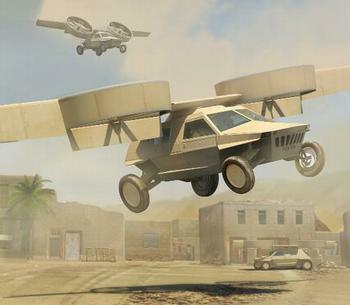 With a flying military vehicle, transportation will no longer be restricted to trafficable terrain that makes movement predictable and easy to track. The goal of TX technology is to enhance capabilities for resupply operations, fire-team insertion and extraction, and medical evacuation – reducing timelines and increasing the probability of survival.